Welcome to Board Watch for WCCUSD’s June 29 Meeting! At the Wednesday, June 29th meeting, our school board members discussed an upcoming Budget Transparency Tool, adopted the 2016-2017 Budget, and approved the 2016-17 Local Control Accountability Plan (LCAP). The Board also recognized the services of outgoing Superintendent Dr. Bruce Harter and Associate Superintendent Dr. Wendell Greer, saluted a new Chinese exchange program, reviewed survey results concerning an 8-year extension of the current parcel tax, approved a new Math Placement Policy for high school students, and debated a legal services contract concerning Charles Ramsey. A handful of community members and stakeholders attended the meeting, which was productive and action-oriented, offering multiple opportunities for our community to engage and share perspectives. Multiple Board members promoted the idea of transparency throughout the meeting, particularly during discussion of the 2016-17 Budget and LCAP. Explore the full meeting agenda. Sheri Gamba, Associate Superintendent, presented the 2016-2017 Budget to the Board for approval. 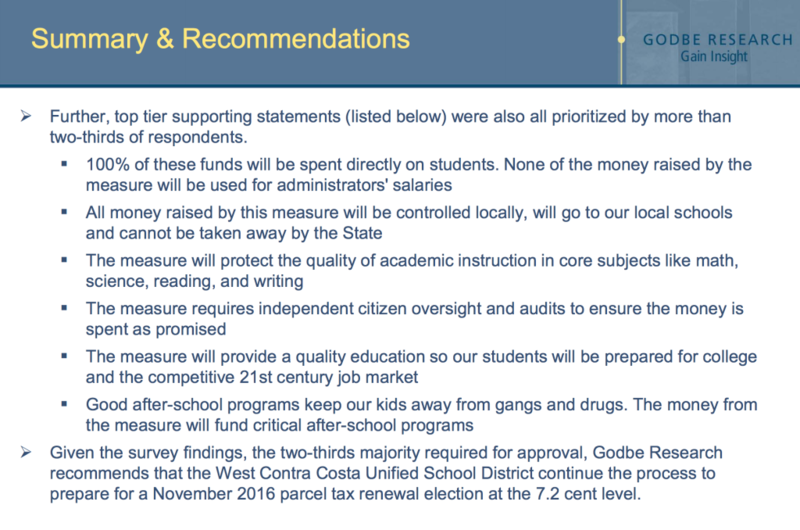 Although the budget was also presented at the June 15 Meeting, Gamba reviewed the various ways the budget would help the district achieve its goals under LCAP and the processes that she and her colleagues used to project the budget for the next three fiscal years. 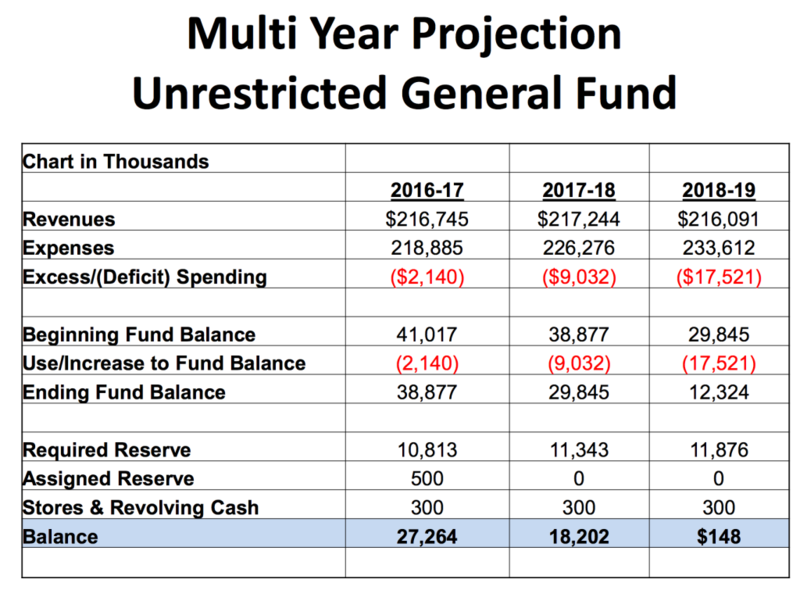 Without further budget cuts, Gamba said, WCCUSD will run a deficit of $2.1 million in 2016-2017, $9 million in 2017-2018 and $17 million in 2018-2019, dramatically depleting the district’s $41 million Fund Balance each year. 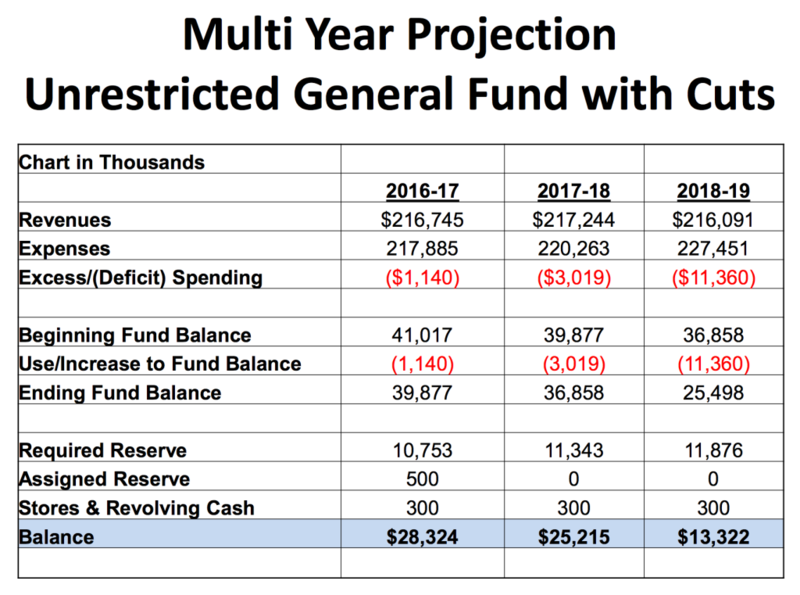 After cuts, Gamba said, the impact on the fund balance will be smaller, but the district will still run a deficit of $1.1 million in 2016-2017, $3 million in 2017-2018 and $11.4 million in 2018-2019, further cutting into the district’s Fund Balance. Why will there still be a deficit in 2017-2018 despite cuts and board guidance? STRS (State Teachers’ Retirement System) contributions and PERS (Public Employee Retirement System) will continue to rise. Enrollment in our schools is predicted to decline. Enrollment is the key measure in determining district revenue. 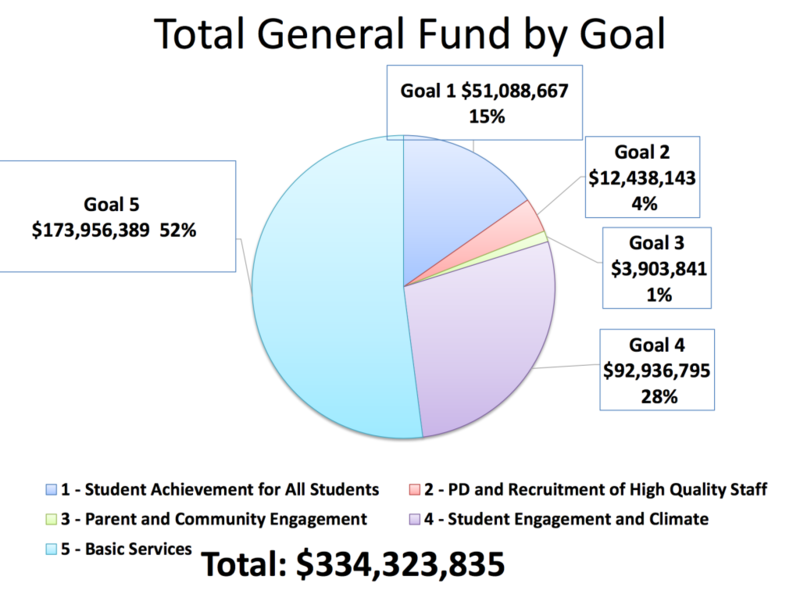 Gamba also broke down the budget by individual district goals to show how the district plans to spend dollars directly on student services and outcomes. This is a marked shift in budget transparency. After much discussion about transparency and ongoing public engagement, the Board approved the 2016-2017 Budget. Explore the full Budget Presentation here. During Sheri Gamba’s budget presentation, she mentioned an upcoming “Budget Transparency Tool,” which will help members of the public track budget items affecting our school sites and hold board members accountable for that spending. Board members Valerie Cuevas and Madeline Kronenberg commended Gamba for this initiative, about which details will be shared at a later meeting, pending a district software update. Nicole Joyner presented the final LCAP (Local Control Accountability Plan). The LCAP is a state-required 3-year plan that shows how the school district will spend its state funding on specific student outcomes. 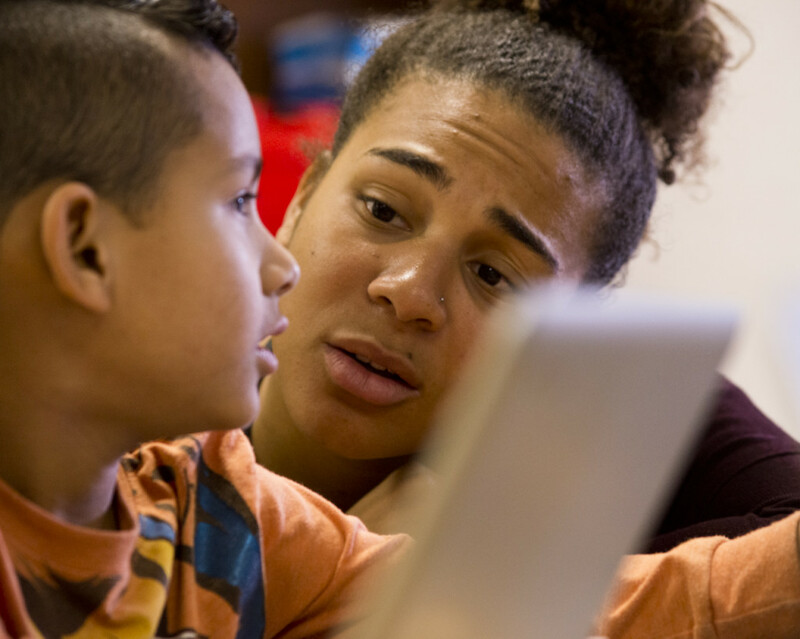 The school district’s budget must also align to the LCAP and show that it will provide excellent educational opportunities for all students — particularly our highest-needs youth. 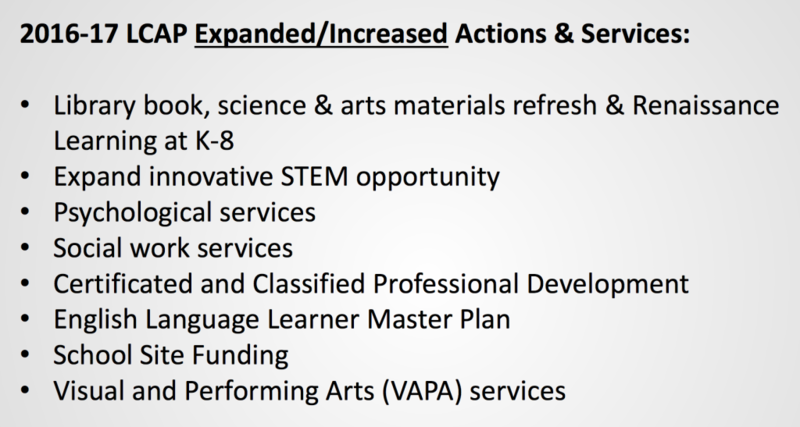 Joyner highlighted the improvements that the district LCAP committee (DLCAP) had made, including an increase of 12 new actions and services beyond the 30 actions and services provided under last year’s LCAP. 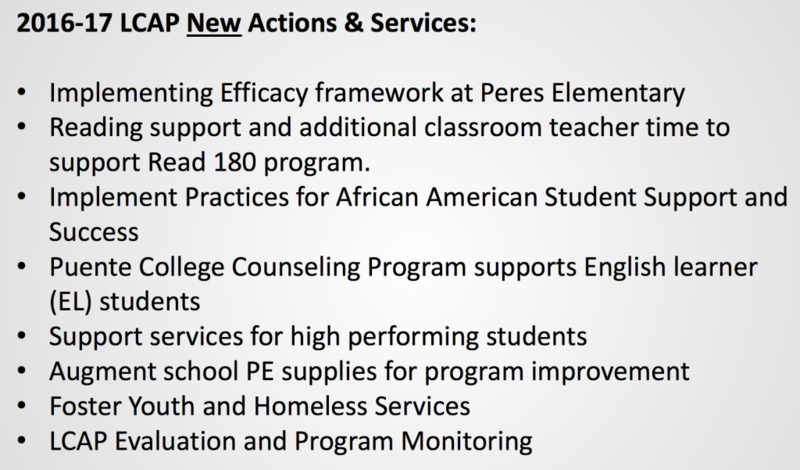 She also indicated existing services now expanded in the 2016-17 LCAP. Members of the public praised the new LCAP’s increased programming for positive behavior intervention, such as the Restorative Justice program, added support for foster and homeless youth, and a reduction in contracts for School Resource Officers (SROs), who are trained school site police officers. This change will save the district approximately $500,000 that can be used for positive behavior intervention programs for our students. The board moved to adopt the new LCAP. Click here for the full LCAP Presentation. Check out the WCCUSD Interactive LCAP. Is the district achieving the goals it set out for funding in the LCAP? Examine the data here. Want to see other school districts’ LCAPs? Click here. The agenda item did not receive much attention during this particular meeting, because it was approved as part of the consent items, which are “routine and will be enacted, approved and adopted by one motion, unless a request for removal, discussion or explanation is received from any Board member or member of the public”. SB-359, which enacts the Multiple Measures Placement Matrix (MMPM), was approved on June 29. The MMPM requires that, as 9th graders enter mathematics courses, they are placed based on multiple state and local assessments. This ensures that students are not unfairly held back in mathematics courses based on only one assessment. It also requires the district to enroll every student in algebra courses, if eligible according to MMPM, by or before his/her ninth grade year. This means that all of our students, regardless of race, gender or ethnicity, have the opportunity to pursue careers in science, technology, engineering and mathematics (STEM). These competitive career pathways often require students to have taken advanced math courses in high school. To learn more about SB-359, the State Law that mandates this change, visit California Legislation Info here. The regular July 6 WCCUSD Board of Education Meeting has been cancelled. The Board recognized Superintendent Dr. Bruce Harter and Associate Superintendent Dr. Wendell Greer for their many years of service to our school district. Both will retire this summer. At the June 15 meeting, WCCUSD began a short-term partnership through July 2016 with Sunny Ivy Education, a California organization that arranges exchange programs between Chinese and American high schools. The district’s goal in this partnership is to give our students access to cross-cultural experiences. A group of high school students from Shanghai began classes at De Anza on June 27. The board recognized the students and teachers. Parcel taxes are special property tax measures that local governments and school boards can use to fund spending or reduce deficits. These taxes must be approved at elections by at least two thirds of voters. 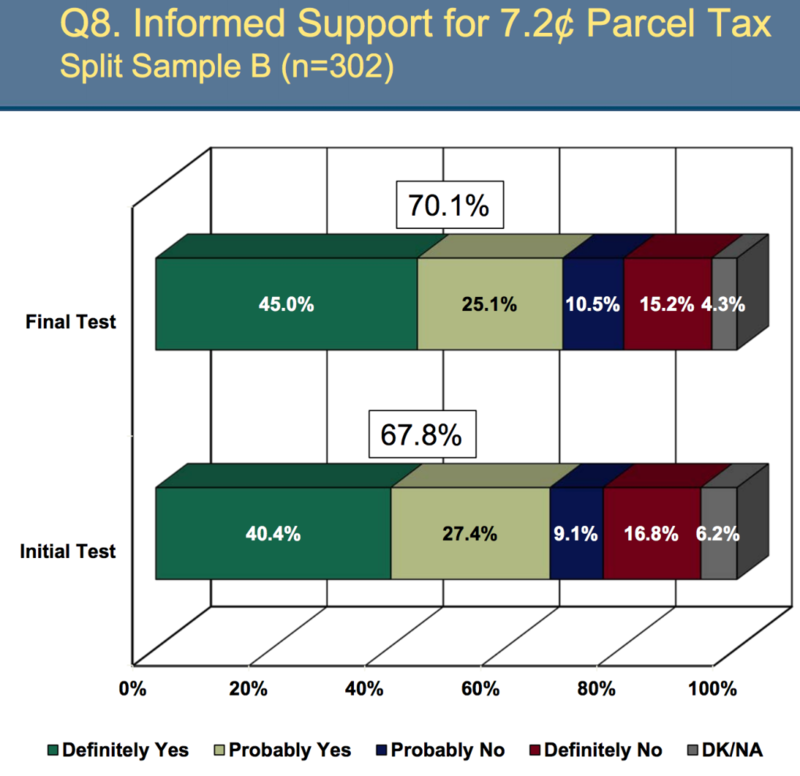 In February 2016, the Board reviewed survey results to evaluate public opinion about renewing a parcel tax that was last approved by voters in 2012. WCCUSD relies on this parcel tax as a critical funding source. Earlier this month, market research firm Godbe Research conducted a second random sample survey to gauge public opinion. Bryan Godbe presented the results of that survey during the meeting. See Godbe’s full presentation and recommendations here. Board member Valerie Cuevas flagged agenda item C4 for discussion rather than passing it in a batch with the other consent items. Agenda item C4 concerned contracts that the district needs to renew this summer. The contracts pending renewal were primarily services and partnerships– printer/copier maintenance companies, YMCA community partnerships, internet providers – but one of the individual contracts in this particular document was for $74,000 to Ramsey Ehrlich, LLP, a law firm (headed by Ramsey’s brother) contracted to defend former board President Charles Ramsey in a recent Securities and Exchange Commission investigation. The investigation followed alleged mismanagement of WCCUSD’s bond program. Cuevas asked Associate Superintendent Sheri Gamba if this sum was a new line item on the budget or a remaining unpaid fraction of the ongoing, already approved $350,000 in legal fees that Ramsey incurred. Gamba responded to show that, indeed, this was part of the original sum owed to Ramsey Ehrlich and had already been approved by the board. The board eventually passed item C4. To see the full list of renewed contracts under item C4, click here.